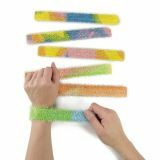 Chenille Slap Bracelets. 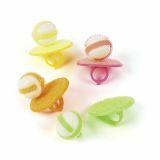 For a quick touch of color, slap one of these on your wrist! Assorted colors. 9"
Assorted. Each bracelet includes a 1/2" enamel flower charm. Expands up to 12" circ. 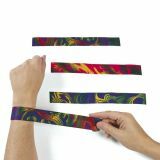 Tie-Dyed Slap Bracelets. Hey, get in the groove! 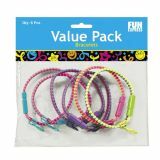 Slap on one of these fun and colorful tie-dyed nylon bracelets! 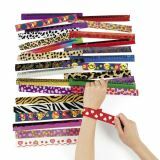 These 9 1/2" multicolored slap bracelets make great party favors at a '60s-inspired celebration. Assorted styles. 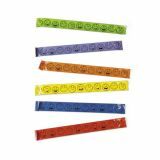 9 1/2"
Plastic Smile Face Slap Bracelets. 9 1/4" Mold bracelets to shape for easier “slap" action. Assorted Neon colors. Assorted colors. 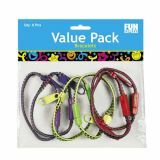 (1 dz./PBH, 4 PBH/pack) 1"
Assorted colors. 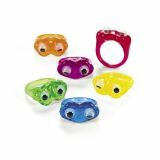 (6 pcs./PBH, 6 PBH/pack) 8"
Rubber Squeeze Frog Rings. Assorted. Each piece bar coded. (1 dz./DB) 1" x 2"